With the launch of the new Clio experience, the release of the second-annual Legal Trends Report, and our biggest and best Clio Cloud Conference yet, 2017 was one for the books at Clio. We’re thrilled to have shared the past year with all of the amazing legal professionals who use Clio every day, and together in 2018, we look forward to continuing to transform the practice of law, for good. Nine years ago, we changed the legal industry with the release of the world’s first cloud-based legal practice management software. This year, we’ve completely reeingeered Clio from the ground up to be faster and more intuitive than ever before. The new Clio experience includes over 220 improvements and was built based on 600+ hours of interviews, 60+ days of visits with Clio customers, and countless hours spent reviewing customer and industry feedback. By implementing the latest technologies and reengineering Clio’s technology, we’ve laid the foundation for a future of constant improvement. We’re only getting started. We’ve made key changes to the core of how Clio operates, making it run five times faster than before. Clio now uses a single-page architecture design, which means the main navigation bars stay in place, and only the content that’s changing on the page reloads. The Global Create button was rolled out for the Clio iOS mobile app at the 2016 Clio Cloud Conference, and then to our Android app. This year, we were proud to launch it as part of the Clio web app. The new Timekeeper allows you to start recording time with a single click from any screen within Clio. Featuring multiple timers, you can now start, stop, and save a time entry from anywhere. Once you pause or stop recording time, a time entry form automatically opens for you to record details—and, to ensure your entries don’t get lost, you’ll be prompted if you forget to specify a matter. Need to handle multiple bills at once? Whether you’re looking at two or ten thousand invoices, bulk actions allow you to complete tasks at scale. Additionally, you’ll have the ability to apply payment to multiple bills associated with a single client with one powerful action. The ability to approve and apply trust payments to invoices with one click makes cumbersome end-of-month billing processes much faster. Start the new year off right: Start using the new Clio experience to help your firm level-up in 2018. Try it for free today. Follow these simple instructions to set it up for your firm in minutes. In 2017, you need an app that lets you truly manage your practice from the palm of your hand. We’re always improving Clio’s mobile apps, and based on feedback from lawyers and legal professionals like you, we rolled out several improvements to our iOS and Android apps this year. If you’re using Clio for iOS, you can now start logging time quickly and easily from anywhere within our iOS app, as the Timer is now accessible via the Global Create menu. If you’re using Clio for Android, you can now save Clio’s Timer Widget directly to your Android phone’s home screen (here’s how you do it) to make it easy to capture and keep track of time without even opening the app. When you have a question about your practice management software, you need to have it answered quickly. Clio is already well-known for its excellent support, and we’re constantly striving to make this easier. In 2017, we added the ability to talk to our award-winning support team from right inside Clio. Live chat is available from 5:00 a.m. to 5:00 p.m. PT (8:00 a.m. to 8:00 p.m. ET). Have a question outside of those times? No problem. Chats sent outside of business hours are sentas an email for quick follow up. Note: We’ve got great tools to help you hit the ground running with the new Clio experience. Here’s a quick overview to get you started. Clio isn’t just practice management software—it’s a platform that works seamlessly with all the leading tools for your law firm. The new App Directory makes it easier than ever to discover tools that make sense for your firm, and that integrate directly with Clio, so your practice can run more efficiently than you ever thought possible. Tali, a voice-driven productivity assistant that allows you to log time to Clio via voice command using any Amazon Alexa-enabled device. Zipwhip, cloud-based software that lets your firm send and receive text messages from your firm’s existing business phone number. TrustBooks, cloud-based software that helps attorneys easily manage their trust account and stay compliant with their state bar. We’ve added plenty more apps to make your firm more efficient and successful in 2018, so explore Clio’s new App Directory today. An Application Programming Interface, or an API, defines how different programs interact with each other. A more robust API means a greater ability for powerful tools to integrate directly so that those using them can access everything they need in one place. Clio is now running completely off of an updated API that has greatly expanded the ways that other programs can work with Clio. With our new API v4, developers are empowered to build even more impressive integrations with Clio, giving you powerful options to personalize Clio for your practice. To jumpstart the creation of even more useful apps that integrate with Clio, this year we kicked off Launch//Code, a contest made to find the most creative, powerful, and useful integrations for Clio. The winning company or business will take home a $100,000 prize, so be sure to tell your developer friends to apply! * Check out the official rules at clio.com/launch-code. More broadly, to support those working on exciting applications that integrate with Clio, we’re also launching the Clio Developer Fund, a $1 million fund that will be used to assist new Clio partners in the development and marketing of their integrations. This year, the Clio Cloud Conference moved from the Windy City to New Orleans, and it’s safe to say it was the biggest and best Clio Cloud Conference yet. Not only did we launch the biggest release the legal industry has ever seen with the new Clio experience, we kicked off our Launch//Code contest, hosted The Reismans, our first ever recognition program for exceptional Clio customers, and launched our second annual Legal Trends Report. Featuring innovative speakers like Chris Hadfield, Haben Girma, and Preet Bharara, attendees walked away with plenty of insights to help them run their practices better. Just look at what Clio user Chris Trebatoski had to say about the conference. The Clio Cloud Conference is the best legal tech event in the industry, so it’s no surprise that passes for our 2018 event are already going fast. Claim your spot now to join us in New Orleans next October! In 2016, we released the groundbreaking Legal Trends Report, drawing on aggregate and anonymized data from over 40,000 Clio users to give solo and small firm lawyers access to unbiased data about legal industry trends important to them for the first time ever. This year, the 2017 Legal Trends Report goes a step further, expanding our analysis of key benchmark trends to include survey data from nearly 3,000 legal professionals and more than 2,000 consumers. Some key findings? Lawyers are still billing only 2.3 hours per day, and are spending 48% of their time on billing and administrative tasks. Read the full report for more insights. This year, we kicked off The Reismans, the first annual recognition of Clio users who demonstrate excellence in one of the following categories: innovation, community work, growth, and best new law firm. This recognition program is named after Catherine Reisman, Clio’s very first customer. We’re so incredibly proud to work with all of the lawyers and legal professionals who choose Clio, and it was an honor to showcase just a few of their stories this year. From technology advocates fighting for work-life balance for busy lawyers, to community champions fighting for fair representation for LGBTQ clients, there were plenty of inspiring stories to take in. See the stories of our winners here. That’s an impressive amount of work done by (in our opinion) the most driven and dedicated lawyers and legal professionals in the world. Every year, Clio donates over $6 million in free Clio access to 100,000 users at over 150 law schools, clinics, and other legal programs. With this access, organizations like the California Innocence Project are changing lives. Provided free access to Clio for law firms affected by Hurricane Harvey and Hurricane Irma. Provided free access to Clio to support access to justice efforts by lawyers’ working pro bono on immigration cases in the U.S. earlier this year. Helped raise $25,000 together with the legal community for the American Red Cross’ disaster relief efforts by kicking off a fundraiser at this year’s Clio Cloud Conference. Named one of Deloitte’s 2017 Technology Fast 500™, which recognizes the 500 fastest growing technology, media, telecommunications, life sciences, and energy tech companies in North America. Recognized as one of Canada’s Top Small & Medium Employers by Mediacorp. Awarded Best Contact Center Culture by the International Customer Management Institute (ICMI). Named one of 2017’s Top 20 Most Innovative Technology Companies by the Canadian Innovation Exchange (CIX). Clio’s Data Operations Team named Team of the Year at the BCTech 2017 Technology Impact Awards. Named as one of 10 finalists in QuickBooks Connect’s Small Business App Showdown. 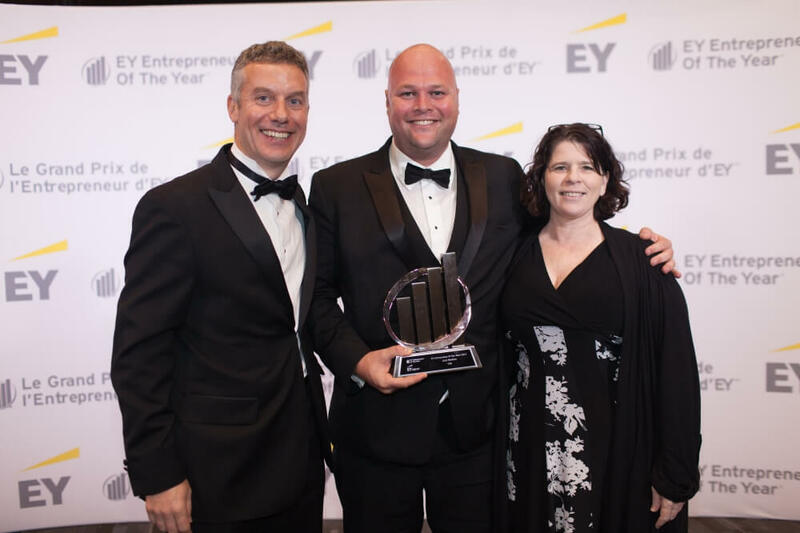 Additionally, Clio CEO Jack Newton was named one of Business in Vancouver’s Top 40 under 40, and was named EY’s Software-as-a-Service Entrepreneur of the Year for 2017! Over the course of 2017, our team grew from 185 to 247 Clions around the world. We welcomed new members to our Product, Customer Success, Customer Support, Employee Experience, Finance, Marketing, and Sales teams, and we can’t wait to continue growing in 2018! We’re looking for amazing people to join our teams in Vancouver, Toronto, and Dublin to help us transform the practice of law, for good. Here are the roles we’re hiring for right now. Thanks for joining us in 2017! To our customers, our partners, our Clio Cloud Conference speakers and attendees, and everyone else in the legal community we’ve been able to work with this year, thank you for your trust and support. We’re on a mission to transform the practice of law, for good. Your dedication to your profession is a key part of that, and we’re excited for what we’ll accomplish together in 2018. Start 2018 off right: Start using Clio, and make your practice more efficient than you’ve ever thought possible. Try it for free today. This post was published on December 21, 2017 . Last updated: December 21, 2017 .